Sitting at the pool or beach with a wine spritzer is how I spent a lot of my summer. It's the perfect refreshing cocktail for a hot day, especially when you add fresh fruit to it! This cocktail is simple to make and you can use a variety of fruits and wine to make up the perfect spritzer. One of my favorites is using Sauvignon Blanc and berries. Place berries into glass, top with wine, then club soda/sprite. Stir together and enjoy (or let sit in the refrigerator for an hour). 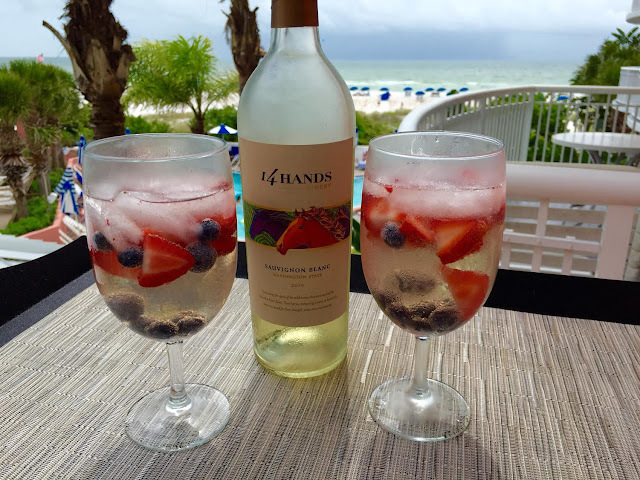 14 Hands recently announced a new addition to their family which I used in this spritzer - the 2014 Sauvignon Blanc from Washington State. This wine has aromas of citrus and passion fruit. Bright flavors of gooseberry, grapefruit and guava lead to a crisp, juicy finish. It is a perfect wine for the summer and can be enjoyed paired with seafood salad, green salad with goat cheese, grilled swordfish or oysters on the half shell. Or it makes a delicious foundation for this Ginger Peach White Sangria recipe.